Pekojan Urban Village, Tambora, West Jakarta holds torch relay on Monday (9/10) night to commemorate Islamic New Year 1440 Hijri.
" We hold torch relay to build a good and harmonious relationship between pekojan residents"
Pekojan Urban Village Head, Tri Prasetio Utomo said, this annual event is participated by thousands residents, public figures, and urban village apparatuses. "We hold torch relay to build a good and harmonious relationship between pekojan residents," he stated. He informed, torch relay is started from urban village office's yard then walking around the villages while praying (shalawat). 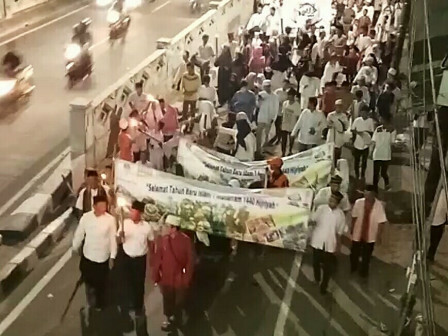 "While bringing torch, some participants are praying and walking through the roads of Pekojan," he mentioned.